I was not prepared to find I Love You, Alice B. Toklas! as funny as I did. 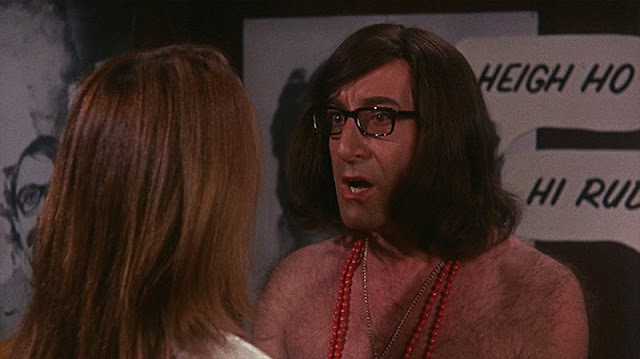 For starters, despite it starring Peter Sellers, I had never heard of it until coming across a clip on YouTube several months ago while searching for something else. Second, it has a rating of only 17% on the Rotten Tomatoes site. Obviously the haters weren't indulging in the same cannabis-laced brownie recipe that plays a pivotal role in the film when they left their reviews, because I think the movie is an underrated delight. Maybe not hysterical, but it definitely had its moments that made me laugh out loud. The premise of I Love You, Alice B. Toklas is about a self-proclaimed "square" lawyer (Sellers) who falls for a flower child (Leigh Taylor-Young) and decides to -- in the infamous words of Timothy Leary -- turn on, tune in, and drop out. 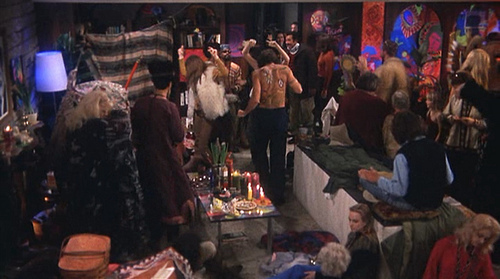 The movie pokes fun at the American hippie counter-culture of the late '60s, and shows that the grass is not always greener on the other side of the shag rug. Alice B. Toklas is not the name of the hippie girl, by the way, but Gertrude Stein's confidante and lover...who was also the unofficial inventor of marijuana laced brownies. The Alice B. Toklas Cookbook, published in 1954, is one of the best selling cookbooks of all time. One thing I noticed right off the bat with the film is that Sellers dropped his British accent to play a Jewish-American attorney. That may not seem like a big deal to moviegoers today where a lot of British celebs take on American accents quite convincingly, but this was the 1960s, where actors and actresses would often be cast into any ethnic background, no matter how far fetched they seemed, without any care for authenticity. Color me impressed, but the only films of Sellers' that I'm familiar with are the ones where he speaks with his natural British accent...or an exaggerated French one! Also, just a warning to anyone overly sensitive to political correctness who intends to watch this movie, but there's an off-color racial gag early on that would NEVER make the cut in a film today without causing an uproar. There's also a car mechanic who complains more than once about his son "running off with a colored girl." And then there's the main character's brother, who wears what he claims is Hopi Indian burial garb to attend a funeral. Sellers sans shirt is also one hairy-scary dude...which made me appreciative of our modern day manscaping trend. Someone get that man a waxing kit, stat! I Love You, Alice Be. Tolkas introduces us to Harold Fine (Sellers) who is somewhat reluctantly engaged to Joyce (Joyce Van Patten), his firm's secretary. 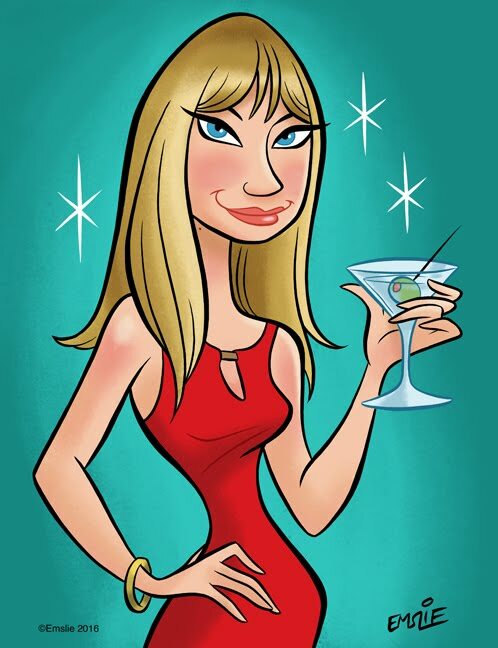 She's 33, wants to settle down, and pesters him until he set a date for their wedding. His co-worker Murray is played by Herb Edelman -- if you're a Golden Girls fan, then you'll recognize him as Dorothy's ex-husband, Stan. Murray is married and has kids but can't resist ogling the young women who walk down the street in their white go-go boots and miniskirts. When Harold's mother comes to his office, distraught, over the death of a family friend Harold barely knew, he sets out to find his brother Herbie who is living the hippie lifestyle in Venice. 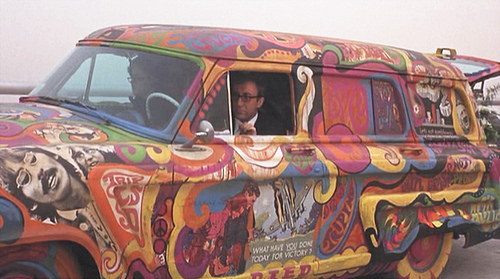 It's worth mentioning here that Harold is already getting a taste of how the other side lives; his car has suffered some damage and his loaner vehicle is a psychedelically painted old Buick with a picture of George Harrison and Pattie Boyd on the hood and a smoky exhaust. On the morning of the funeral, he is introduced to his brother's friend Nancy, a wide-eyed girl who reminded me of a cross between Lauren Hutton and Julianne Moore with a breathless voice like Marilyn Monroe. Hilarity ensues when Herbie appears looking like an extra in a badly made Western; he tells Harold he'll remove the feather or the face paint, but not both. At the funeral home the hearse drivers are on strike, so the casket gets transported to the cemetery in Harold's multi-colored ride. Because he gets pulled over and continuously lost trying to locate the burial grounds, he doesn't arrive to the grave until after sunset. After his brother abandons Nancy on the city streets for the company of another woman, Harold takes her home to his apartment where she can spend the night on the sofa. Nancy is soon rolling doobies after Harold retires to bed. The following morning, she asks him if she can hang around for a bit after he leaves for work, and finds a box of brownies in the cupboard. 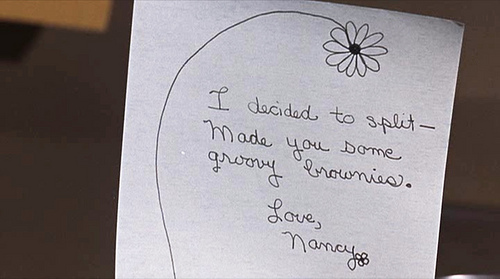 She makes the mix and adds her secret ingredient, leaving a note for Harold that she made some "groovy brownies" for him. That evening after retrieving his repaired Lincoln, Harold is greeted at his apartment's entrance by his parents and fiancée Joyce, who wish to go over the wedding guest list with him. Joyce finds the brownies, which the family declares as so good, they begin devouring them with an orgasmic cacophony of "mmmms" and moans...followed by delirious laughter. Harold's folks can't stop laughing and singing and Joyce is removing Harold's clothes, asking him to take her now, right there on the couch, in front of his parents. Thankfully, Harold's father says he wants to go play miniature golf. During the game, Harold vanishes into the clothing shop Nancy works at to thank her for the treat. Later that night he takes her back to his apartment where they make love and he declares that the earth moved, something that hasn't happened with Joyce in a long time. A switch has now been flipped and on his wedding day, Harold shocks everyone by leaving Joyce at the alter, claiming that she doesn't know him and that it wouldn't be fair to give her a lifetime of misery. Harold now goes into full-on hippie regalia mode with Nancy...growing his hair and changing his wardrobe with the pair living out of his car which has now been painted like the psychedelic rental. He meets with a guru for seashore walks who spews New Age garble about flowers and not trying so hard to find himself. But what started out as peace and love soon turns into a bad acid trip. Harold's once Don Draper-esque apartment has now become -- in his mother's words -- a pigsty and central headquarters for drop outs and their animal companions. Nancy's attention is on other guys. She also wants to go see a six-hour movie called Mondo Teeth which shows nothing but...teeth. In one funny sequence, Harold has hallucinations of his parents tripping. Harold comes to his senses and realizes that the whole scene is not truly his bag and has failed to bring him the fulfillment he was desiring. He cleans up his act and there's a second trip down the aisle with Joyce...but at this point I can't give away the ending. Actually, the ending is my only complaint with this movie as it seemed tacked on and unsatisfying, but this is a romantic comedy, after all -- not an Academy Award winning film. Perhaps it is the reason for the lower starred reviews on movie sites. I Love You, Alice B. Tolkas! can never compete with the roster of great films that were released in 1968, but it's a wacky, trippy time capsule into the late sixties and if you're a Sellers fan, I definitely wouldn't pass on it. It also gave me a serious craving for brownies (without the pot, of course!) Here's the trailer. -cool that you found this wacky gem of a film thanks to the wonder of Youtube. When I was a kid, 'I Love You...' would air every so often on regular TV. It is, in a word, trippy. Thanks for the comments, Bea and A Vintage Nerd. The movie definitely is trippy! And it provided me with some much needed laughs. I remember watching it many years ago. Although I did not find it very funny, I was touched by its portrayal of what is ultimately an unhappy man. About the ending, that's actually the one part that has stuck with me, him running through the streets wondering if there is more to life than this (unhappy state). very existential.